Neenah Paper's Illustrated Guide to Chicago for HOW Design Live 2017: Seven different ways to experience Chicago. Following the previous city guides in our series, New Orleans with Neenah (2015 AIGA Conference) and Neenah Presents Atlanta (2016 HOW Design Live; PRINT Magazine's 2017 Typography and Lettering Awards "Best in Class" Winner), Neenah Paper commissioned me to create another illustrated giveaway for HOW Design Live 2017 in Chicago. This accordion fold, limited edition piece takes the viewer through seven different maps of Chicago, each with a different lens through which he or she can experience the Windy City – from seeing Chicago as a designer, to experiencing the city on the hunt for the best pizza. The print piece was distributed to conference goers as a promotional piece. 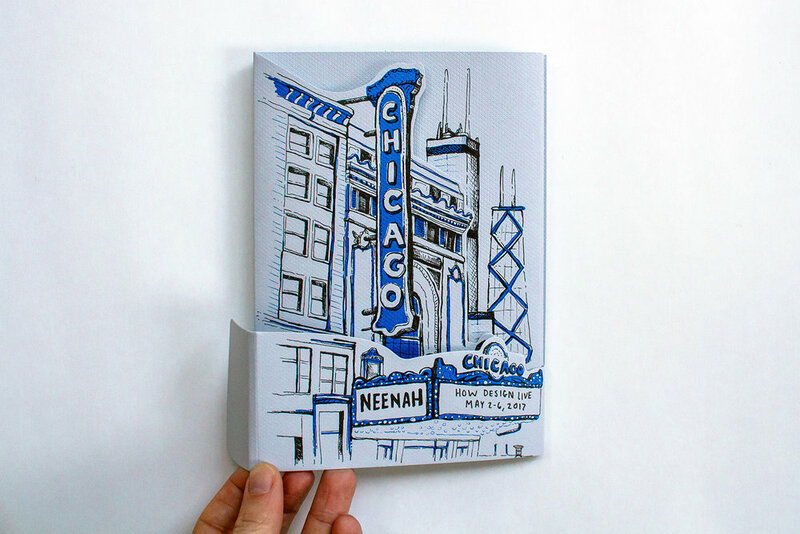 The city maps use 5"x7" panels in an accordion folded piece, with an intricate, die-cut cover assembled out of three layers – the front of the Chicago theatre drawn on a small, wraparound belly band with a small, velcro dot to envelope the overall piece; the main structure of the Chicago theatre, with a diecut following the edges of the building; and, this die-cut lets the viewer see through to the first inside panel, which creates an image of the Chicago skyline sticking up from behind the theatre, completing the overall cover's image. The hand-drawn illustrations and addition of a single, simple spot color create a fun and playful design around the content, assembled on the cool gray of Neenah's new line of Techweave papers.